It may be a word game. It might also be genius marketing because Miami Dice feels like something familiar. Most likely is both the theme and name inspired from the popular TV-series from the 80s. When looking at the site, it is difficult not to think of Don Johnson dressed in a white suit in a sunny Miami. As a casino geek, associations are also made to the jackpot slot Mega Fortune where you can find both cigars, champagne, and luxury watches. Also, the color theme on the site is something that must have gotten its inspiration from the TV series. The colors are Pink, turquoise and yellow in a combination that wakes you up. Apart from that, you will face information regarding the welcome offer and graphics that display the total sum of all jackpots available. With a 200% deposit bonus up to impressive £2500 on the first deposit, Miami Dice offers one of the biggest deposit bonuses in the world. On top of that, all new players also get 50 free spins on the familiar slot Starburst. The fun does not stop by after that. The second bonus is matched by 50% up to £500 + 100 free spins on Gonzo´s Quest followed by a third bonus matched by 75% up to £500 + 50 spins on the slot machine Theme Park. In total, £3500 and 200 free spins are up for grabs. The terms and conditions state that the wagering requirement is 35 times the money, making the welcome offer even more attractive. Under the campaign site, Miami Dice shows off their large selection of different jackpot slots. Mega Fortune is an obvious slot in the context, but Miami Dice can also brag about slots such as Super lucky frog, Win Star and The Pig Wizard which adds up to the fact that there is more than £10M in jackpots to win in the casino a normal day. Miami Dice also has a vast selection of other slot machines distributed by over 20 different game providers. Despite its young age, that makes it possible for Miami Dice to compete with the established much bigger online casinos out there. According to their casino site, you can choose to play between 1000 different slots. Whether that is correct is difficult to verify, but there is no doubt it is a lot of slots. Miami Dice is also fast when presenting new slots, bingo games, and scratch cards. When browsing campaigns at Miami Dice, the casino has a contest where the first prize is a trip to nowhere else than Miami. The rules are simple, for every £100 deposit customers get 10 points where you need 1000 points to qualify for the price draw. 》If you are interested in becoming a VIP and have high roller status at other casinos you can get it instantly at Miami Dice. All you need to do is send a proof of your ID as a print screen or similar to vipapplications@miamidice.com. As a VIP customer, you will then receive offers about participating in private VIP tournaments, an own dedicated VIP manager for your questions and of course exclusive bonuses. For “normal” customers, the slot site offers support around the clock, which is almost as good as the dedicated VIP-agents. A happy surprise with the site is the wide range of different payment methods. Here you can deposit and withdrawal money with Giropay, Dotpay, Paysafe cards and of course the more traditional methods such as Visa or MasterCard. For everyone that likes the feeling of Miami, high jackpots and a wide selection of slots, Miami dice is a slot site worth trying out. The best thing with the casino is the extremely high welcome offer. 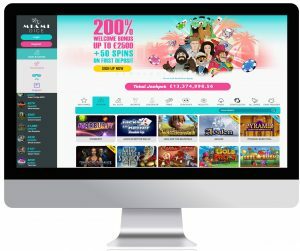 Out of all online casinos reviewed at this site, Miami Dice has the highest bonus at the moment. 200% up to £2500 is hard to match and with such a bonus for new customers only fantasy set stop for what they will offer their VIP players. Two thumbs up for Miami Dice and their interpretation of the TV-series.